From an early period in Greek history, ornamented bands made from sheet gold were worn around the head. 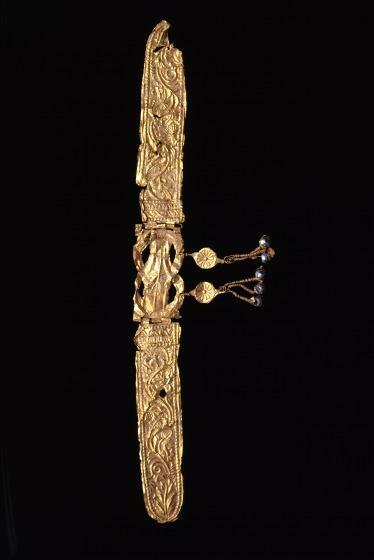 These diadems varied from simple gold or silver bands to pieces with stamped and applied decorations. Three pieces in the collection of the Dallas Museum of Art illustrate the development of the Greek diadem from the Archaic to the Hellenistic periods: an Archaic gold band with separately made rosettes [1991.75.38], a Classic Greek diadem with an ornamental frieze [1991.75.54], and this elaborate, three-dimensional diadem that embodies the Hellenistic style. The Hellenistic period saw the invention of very elaborate, three-dimensional types of diadems like this. 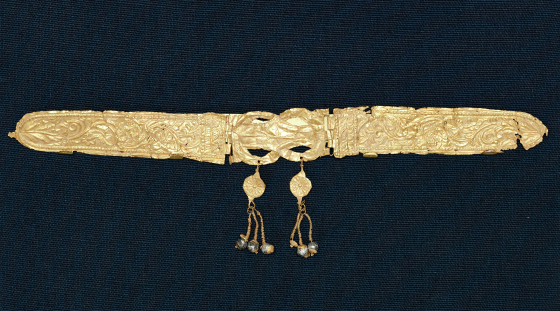 The two lateral sections of this diadem are decorated in repoussé with an elaborate tendril scroll and joined to a central Herakles knot by hinges made from strips of sheet gold. A simple wire, possibly modern, forms the hinge pin. Suspended from the lower edge of the Herakles knot are two repoussé rosette disks. Each supports a beaded tassel composed of a gold rod, coiled wire, and three globular blue glass beads in rosette-shaped settings. Many diadems have been found in Greek tombs dating to the 6th century BCE and continuing through the Roman period (2nd century BCE). The diadems could have been worn in life at banquets, as victors' prizes in war or athletic competitions, or on religious or civic occasions, but their burial defined a different kind of triumph. Barbara Deppert-Lippitz, Ancient Gold Jewelry at the Dallas Museum of Art (Dallas: Dallas Museum of Art in association with the University of Washington Press, 1996), 17; 142. According to the Roman writer Pliny, the decorative device of the Herakles knot could cure wounds, and its popularity in Hellenistic jewelry suggests that it was thought to have the power to avert evil. See another piece of Hellenistic jewelry with a Herakles knot.